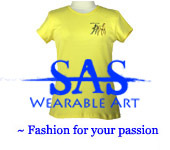 Wearable art, also known “art to wear” refers to individually designed hand-made clothing as fine or expressive art. The concept is nothing new, for years artists have been adorning t-shirts, jewelry and hats with select works of art in the hopes of extending the image or message of the work of art so that more people are exposed to fine art and the piece itself can do more visibly than it would hanging on a wall in a gallery. With advances in digital printing technology it is now possible to transfer original works of art onto clothing and other apparel without sacrificing too much of the original color and integrity of the artwork. Before reproductions on cotton and other clothing fabrics produced faded and sloppy reproductions that would look good once but after being washed the color would fade and the original message or expression was then lost. One of the more popular themes for artwork and consequently wearable art is horses. For centuries the horse has captivated the imagination of artists working in oils, sculpture, poetry and many other form of artistic expression. Equine theme artwork captures both the fascination man has with horses as well as the superior study horses make for works of art. Now fine art prints can be digitally printed onto clothing and other apparel for truly unique and expressive wearable art. There are many perks to having artwork embroidered or printed onto clothing and apparel the most obvious being the amount of exposure a piece of art gains by being worn outside of a gallery. Often people have to seek out pleasing works of art in a gallery, shop or museum but with wearable art the piece itself is virtually advertised by the person wearing the hat, t-shirt or other form of apparel and people who would otherwise never have seen the fine art piece are now exposed to the beauty as well. Wearable art also serves to extend the life of a piece of art by creating yet another vehicle for the piece to be seen and presented to a wider audience. And unlike stuffy art galleries and exclusive auctions wearable art is free to anyone who chances to see the print and the more a piece of art is seen the more indelible it becomes in the minds of those viewing it. Wearable art is affordable, unique and a great way to expose entirely new groups of people to the beauty of fine art.